Roald Dahl's Willy Wonka, Jr. Follow enigmatic candy manufacturer Willy Wonka as he stages a contest by hiding golden tickets in five of his scrumptious candy bars. Whoever comes up with these tickets will win a free tour of the Wonka factory, as well as a lifetime supply of candy! 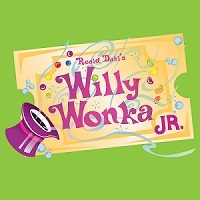 Roald Dahl's Willy Wonka JR. is a scrumdidilyumptious musical guaranteed to delight everyone's sweet tooth. *Includes NC Admission tax and are subject to availabilty.